London based outfit Dry the River recorded their second album shouldering a heavy burden of expectation following the near ecstatic reaction to their 2012 debut Shallow Bed. That debut showcased a very obvious talent – even a cursory listen to their music and it was easy to see why so many people were getting so hot and bothered about them. 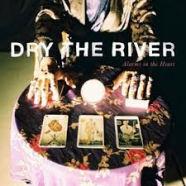 From the outset, Dry the River were a band that seemed destined for greater things; second album Alarms In the Heart will only serve to confirm that view – it’s bigger, brighter and more ambitious than its highly acclaimed predecessor. The indie folk leanings of Shallow Bed that saw them slide a little too close to bearded hipster terrain have been gently eased aside for a more anthemic, indie rock sound. The tight harmonies and soaring melodies that drew comparisons to the folky Americana of bands like Fleet Foxes are still there, but it’s set against the backdrop of a more muscular, guitar heavy sound. Singer Peter Liddle is the perfect cross between Jeff Buckley and Elbow’s Guy Harvey, and his beautiful, melodic falsetto dominates tracks like ‘Gethsemane’ and the gorgeous ‘Vessel’, slower numbers that have a certain intimate grace not often found in rock music as ambitious in scope as this. The surging guitar rock of ‘Hidden Hand’ and ‘Med School’ are arena anthems in waiting, featuring some impressively epic fretwork from guitarist Matthew Taylor. Consistently strong throughout, songs like ‘Rollerskate’ and ‘Everlasting Lights’ strive for a sound to fill stadiums while still somehow managing to remain strikingly intimate. Lyrically, they avoid the clichéd overblown sentiment present in so much music of this ilk – lines like ‘They’re cutting up the bodies in the med school basement| And I am only watching on an academic placement…’ are not your typical fare. No doubt some critics will eye Alarms in the Heart with a degree of suspicion, interpreting the move towards a more stadium friendly sound as overly ambitious so early on in their development. All all the indicators are that they are more than well equipped for it – with Alarms in the Heart, Dry the River have fashioned an album of elegant arena rock, a beautifully crafted collection that will only enhance their already burgeoning reputation.